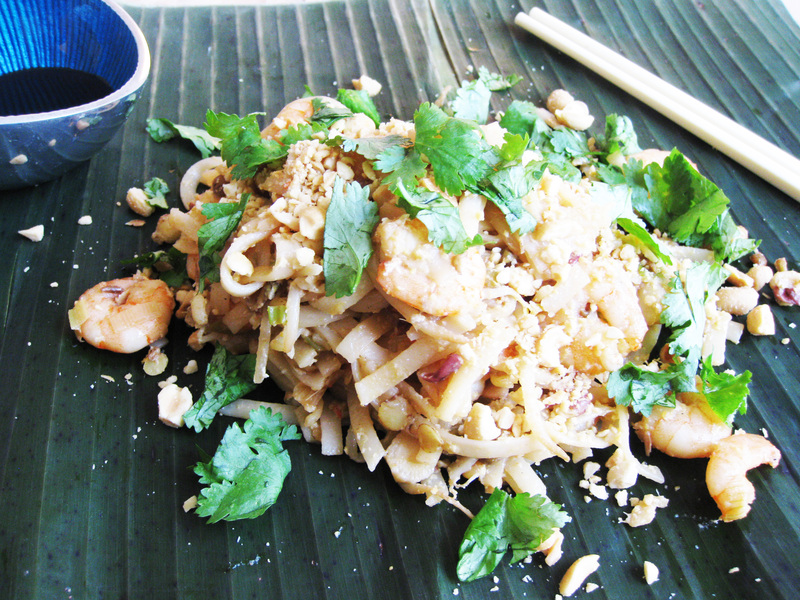 One of the most well-known Thai dishes, Pad Thai is a wonderful street food meal. It’s incredibly simple to make and can be whizzed up in minutes. But it’s easy to get it wrong. Too much sugar, too little lime juice, or lacklustre prawns are a commonplace failing. Here I’ve added just a small amount of sweetness, along with a good amount of spiciness and saltiness. And I’ve used spring onions and beansprouts but then also added sprouted seeds, including mung beans, chickpea sprouts and lentil sprouts – for added munchiness and a good dollop of nutrients. Fast food doesn’t need to be junk food – and this dish proves it in one fell scoop. 1. Put the noodles in a large heatproof bowl, cover with boiling water and leave to stand for 5 minutes or until soft. Drain well. 2. Meanwhile, put the chilli, garlic, ginger and shrimp paste in a mini food processor or spice mill and blend until finely chopped. 3. Heat the oil in a large wok over a medium-high heat until hot. Add the chilli mixture and stir-fry for 30 seconds. Add the spring onions and stir-fry for a further minute until they soften. Pour the fish sauce in and sprinkle the sugar over. Add the beansprouts, sprouted seeds and prawns and stir-fry for 2–3 minutes until cooked through but the vegetables are still slightly crunchy. 4. Push the ingredients to one side of the pan, add the egg to the other side and stir-fry the egg until cooked. Mix the egg into the other ingredients and add the cooked noodles and stir thoroughly to mix everything in. Add the lime juice and stir through. Serve immediately (on banana leaves if you like) with the peanuts and coriander scattered over, and with tamari sauce on the side.